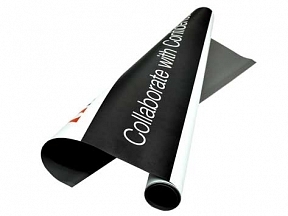 Get the most out of your Roll up Banner by changing the display when your promotion has expired! It’s a tricky procedure and it’s a two person job but with a little care you can change your prints yourself and recycle your display mechanism. You need a flat table for your workspace. 1) Extract the banner past its full extent. 2) Carefully separate the print from the flexible internal film. 3) Attach the new print and carefully feed back into the mechanism. All replacement prints are printed at 1440dpi on anti curl light block material, the same high quality material we supply as standard with roll up banners.